Request a quote from Michelle at At the Rocks Guesthouse. 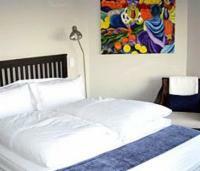 Sleeps: 2 Rooms / Units: 0 from Price on request per night Queen size bed, with spa bath, en-suite shower and toilet and beautiful views of the lagoon and rocks. Additional message to owner Optional At the Rocks Guesthouse says: Dear Guests, please let us know whether you require airport transfers or any other pre-bookings. We can arrange a transfer from the airport to Leeuwenvoet (or return) at a cost of R280 for two people per trip. There is a slight surcharge if the transfer takes place before 6 am or after 10 pm.